The Brown Family continues to grow but, this time, it isn’t one of Kody Brown‘s four wives who will be shooting out the newest addition. Anyway, Madison told People magazine that she is due to give birth to Baby No. 2 in August, and that she and Caleb do not know the baby’s gender yet. In an Instagram post announcing the pregnancy, Madison let ‘Sister Wives’ viewers see her baby bump. To date, Axel is the only grandchild in the Brown family. Two of the family’s other children– Aspen and Mykelti– are each married, but have not had any children. Madison’s “sister moms” (well…some of them, anyway) expressed their excitement over the new addition. “So excited for another grand baby!! Thanks Maddie!” Kody’s third wife, Christine, wrote in the post’s comment section. “I’m over the moon with excitement!! Can’t wait to hold this new baby!” Janelle wrote. In a video posted to TLC’s website, Maddie and Caleb revealed that they are in the process of moving to North Carolina. “We are moving to North Carolina for a job, Caleb got a job, and we’re excited for this new change,” Maddie said. “We’re moving across the United States with nobody there, nobody that’s family,” Caleb said. As ‘Sister Wives’ viewers know, Kody, his wives and some of their younger children recently moved from Las Vegas to Flagstaff, Arizona. 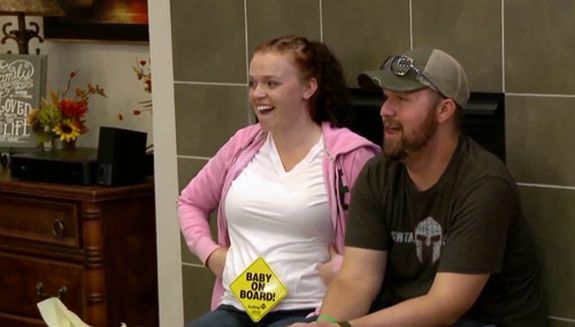 Click here to read The Ashley’s ‘Sister Wives’ recaps! I thought Mykelti and the TONS of FUN were pregnant ALSO? She however looked so good on the show last night…but she DID look pregs.?????? They are leaving the west cost for North Carolina? They will regret it! I live in North Carolina and out of all the places in the country to live it is probably one of my least favorite. The only place that I disliked more was Pennsylvania. Good news on the baby but great news that they are putting some distance from the dysfunctional Kody and Co.
I’m just glad it’s still not Tony and Mykelti. That guy is terrible. Ashley, your computer has processed so many Jenelle news that it automatically changed the spelling of ‘Janelle’ to ‘Jenelle’. Your computer has the trash virus. I don’t need the image of Tony stuffing his face in my head. Congratulations to Maddie and Caleb! I still refuse to accept that Tony is a real person. He and his family have to be actors, cast specifically to make Cody seem less terrible. He just so gross and badly behaved. There’s no way that’s real. I hope.